The Holiday season is upon us! 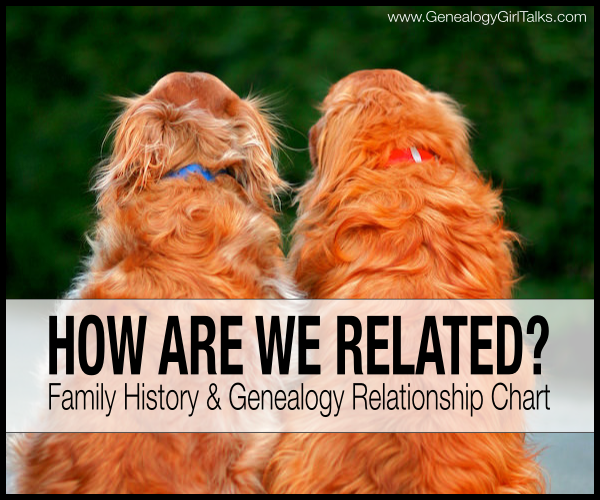 If you are anything like me, you are visiting family and discussing your Family History with those you love. Do you find yourself confusing your family when you begin talking about third or fourth cousins? Do the words "she's our third cousin once removed" provoke a blank stare from your loved ones? Well, the wonderful people over at Crestleaf.com have recreated a beautiful infographic (chart) to help you explain these relationships to your family. The best thing about this chart? It is printable! Yes, you can print it out and take it with you! If you prefer not to print it, you can always show it to your loved ones by visiting crestleaf.com on your tablet or mobile device! You can find this beautiful chart HERE. I have a Relationship Chart that has been very easy to use for several years that is easy to explain and to show how two people are related. I now have it scanned to be able to show my beginner students (and others) the chart online during "GoToMeeting" classes or webinars. I also have had the relationship calculator on both genealogy software programs (PAF and now Legacy Family Tree). The program makes it very easy to determine the relationship between anyone you have in the database. If you would like to see the Relationship Chart that I've used for 25+ years, please feel free to email me: valsroots [at] yahoo [dot] com.